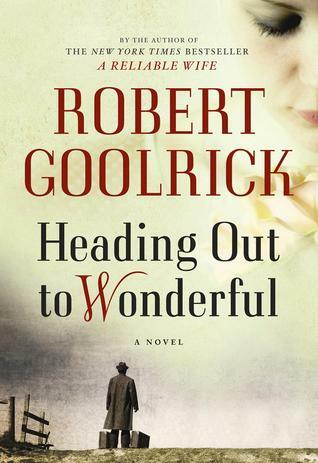 I couldn’t wait to dive into ” Heading Out to Wonderful” by Robert Goolrick. He wrote the New York Times bestseller, “The Reliable Wife,” a couple of years ago. It was an unputdownable tale that was edgy and exciting. This new novel takes place in Goolrick’s backyard, one he knows well: the lovely countryside of Virginia. And I just found out that this new novel is solidly based on a true story he was told some time ago. The real story took place in Europe. Goolrick chose to reenact it here where he could bring more that he knows to the plate. And boy oh boy has he! This is Goolrick’s second novel. So many times a second novel is not as compelling as a first. Many times, in fact. But this one may even surpass the first. It’s a yummy tale full of angst and rich with revenge. Can you tell how excited I am ! Charlie Beale makes himself right at home. He quickly begins buying up land in this small town and its surrounding area. Why would he do this? How much money is in that suitcase? How did he get it? Charlie befriends the local butcher and his wife and the story begins. This story is told through the eyes of a five-year old boy. He is telling the story when he is in his sixties. But Goolrick has so nailed this voice. He has always thought to write a novel about it. And he has done it justice. And then some. Sam Haislett is the little boy. Charlie Beale takes a liking to this quiet little guy and they become almost inseparable. Sam’s parents are the Butcher and his wife. But all is not as it should be in Charlie Beale’s world. Even though the people of Brownsburg have come to trust and like Charlie, this goes only so far. And it is a very small town. You can see the writing on the wall once the town’s richest man’s wife catches the eye of Charlie. Boaty, the richest man in the town, visits a colony of misfits living in the valley nearby. Here he’s making an offer to buy a young girl from her father. ” I’m offering you, say, three thousand dollars, a new tractor, and a better life for both you and your family and the girl Sylvan. There’s one condition.” Boaty then proceeds to tell the father what the condition is. And it will prove to be life changing for Sylvan. Promises made in desperation are rarely kept. Mostly, they return to haunt you. In this case, you will be reading late into the night wanting to know every gritty detail. Goolrick’s sense of place is such that you can feel the temperature change, see the clouds as they drift across the azure sky, and begin to feel the moods change before they occur. He really does have this area of the world right on the money. This story became like a runaway train while I was reading it. I wanted it to last and last, but I couldn’t put it down either! Goolrick’s timing is superb, his pitch is perfect, and he does the finish just right. Robert Goolrick just gets better and better. What an amazing writer to watch. You are in for such a treat with this one. My galley came from Algonquin. I can’t thank them enough. I loved his first novel and this one sounds just as good… thanks! I can’t wait to read it!! I really enjoyed Reliable Wife even though it got some mixed reviews. You are going to LOVE it. I had customers love RELIABLE WIFE who I would never in a million years think would even read it. I know he is a bit racy, but I love his books. Can’t wait for more. Sounds awesome; looking forward to it. I picked this book up by accident and was so completely taken in by Charlie Beale. I didn’t want this story too end but I wanted to also shake some sense into these characters. An absolutely fabulous read.